As the North Korea threat grows, a dark horse consolidates support. With less than three weeks to go before South Korea’s presidential election, recent polls show the race tightening. Previously, Moon Jae-in of the Democratic (or Minjoo) Party held a sizable lead; now he is running nearly even with Ahn Cheol-soo of the People’s Party. In March, prior to the official party nominations being decided, Moon was holding steady at around a 20 percentage point lead over Ahn. According to a Gallup Korea poll taken between March 21 and March 31, Moon had support from 31 percent of Koreans, followed by 10 percent for Ahn. Interestingly, another challenger from Moon’s own party, Ahn Hee-jung, currently the governor of Chungcheongnam province, was in second with 17 percent of the vote. One might have expected that, once Moon locked up the Democratic Party nomination, he would also have added Ahn Hee-jung’s supporters to his camp. Instead, Ahn Cheol-soo’s polls number have received a major boost. In the latest poll from EMBRAIN, released earlier this week, Moon was polling at 40.9 percent to Ahn’s 34.4 percent. A poll commissioned by Yonhap News Agency and KBS released earlier in April actually put Ahn ahead of Moon, with 36.8 percent to 32.7 percent. In all recent polls, Hong Joon-pyo of the Liberty Korea Party was a distant third, with support in the single digits. The Liberty Korea Party was formerly known as the Saenuri Party and recently rebranded in a likely futile attempt to avoid the fall-out from impeached President Park Geun-hye’s political scandal. Another branch of the erstwhile Saenuri split off altogether to form the Bareun Party. Yoo Seong-min, Bareun’s candidate, has yet to break 5 percent support in opinion polls. In contrast with the other candidates, Ahn Cheol-soo’s support far exceeds support for his party. The fact that so many of his supporters come from outside the moderate People’s Party support base could be seen as indicating greater uncertainty and potential for fluctuation compared to the other candidates. Ahn himself is fairly new to politics. He made his name as a software entrepreneur before entering the political scene in 2012, when he attempted to run for president as an independent candidate. He was later convinced to join the New Politics Alliance for Democracy (the forerunner to the Democratic Party), but the alliance proved short-lived; in December 2015, Ahn defected to form his own party, promising to shake up Korea’s two-party system as an outsider. “I can see how badly voters across the nation want to change politics,” Ahn said after the 2016 National Assembly elections – and that was before the massive corruption scandal that ousted Park and energized voters (particularly young South Koreans) to demand political change. Meanwhile, North Korea’s continued provocations may also be working in Ahn’s favor. South Korea’s liberal parties have historically been more interested in engagement with Pyongyang. Moon himself was the chief of staff for former President Roh Moo-hyun, who embraced the “Sunshine Policy” in his approach to North Korea. That opens Moon up to the traditional criticism dogging South Korea’s liberals: being “weak” on national security issues. Moon’s opponents were quick to seize on this line of attack during the second televised presidential debate yesterday. 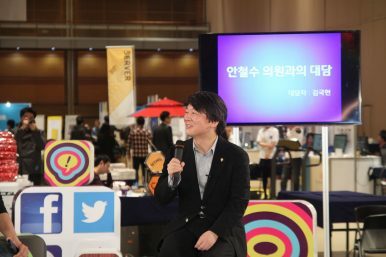 Hong and Yoo, the two conservative candidates, both criticized Moon for his previous approach to North Korea during the Roh administration, and for his opposition to deploying a U.S. missile defense system on South Korean soil. Moon strove to counter this criticism by saying deploying the Terminal High Altitude Area Defense (THAAD) system was “inevitable” if North Korea carried out another nuclear test. He also emphasized the “need to closely talk and coordinate with our ally the United States,” an attempt to guard against criticisms that he has anti-American leanings that could damage the U.S.-South Korea alliance. Ahn, meanwhile, positioned himself as firm on security issues, unequivocally calling for the deployment of THAAD and accusing China of not doing enough to halt North Korea’s missile and nuclear programs. In doing so, Ahn broke with the traditional stance of a “liberal” politician; he may be hoping to find a sweet spot where he can attract young and progressive voters with his stance on corruption and the economy while also reassuring conservatives that South Korean security is safe in his hands. The North Korea issue isn’t likely to fade from prominence anytime soon. In fact, analysts are already speculating another missile or even nuclear test could be in the works for April 25, which marks the 85th anniversary of the founding of the Korean People’s Army. That would leave South Korea’s candidates with just two weeks to respond ahead of the May 9 election. New Third Party Stuns Mainstream in South Korea’s ElectionsThe Deeper Meaning of South Korea's Constitutional DebateSouth Korean Conservatives: What Now?Can South Korea’s 2 Main Parties Learn From Each Other? Is Moon Jae-in Becoming a Lame Duck?